I am, if nothing else, a gamer with an astronomical amount of backlog. I cannot overcome that what-a-bargain impulse when I see a game I think I might like for $20 or less – turns out that if you do that for a few years and never have time to play any of them, they sort of build up. As a result, I have chosen twelve games from my catalog which I have never played or beaten despite the very best of intentions, and I simply must beat them before making any other major gaming-related purchases - that's the theory of it, anyway. Of course, I can bring you guys along for the ride! How Very Lucky you are. 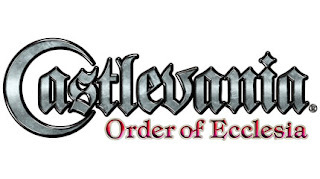 The first of these dozen games was Konami’s most recent Castlevania title for the DS, Order of Ecclesia. Game journalists must be paid by the word, because an accurate review of this one could state simply “this is a Castlevania game” while providing a link to a ten-year-old review of Symphony of the Night. It is another mostly by-the-numbers sequel that will entertain people who like the whole “2D action-platforming with RPG elements” thing, but won’t win over anyone on the fence about the franchise. Its Glyph system makes weapon switching easy – you can have three different sets of equipment, each consisting of two weapons and a special move, all swappable by means of a simple button combo - but all things considered it’s just another method of getting into your hands the same Castlevania equipment you’ve always used. Its early focus on stage-based play as opposed to the Metroid-esque free-roaming castle of other games is worth mentioning, but has little effect on actual gameplay. The game’s heroine (who seems like she should have more emotional baggage than a busload of Dashboard Confessional fans) could charitably be described as “uninteresting.” She is an orphan, and all the people she knows and loves are crazy or evil or both. This could be an intriguing nugget of personality, but even if it weren’t an overdone trope it’s not explored with any degree of seriousness. The axe-wielding Dracula-slaying Castlevania gameplay drives the title forward, just as it always has. Why, then, are there nerds on Wikipedia right this very minute debating the intricacies of the Castlevania timeline? Why did series creator Koji Igarashi feel strongly enough about certain franchise entries to cut them from its narrative continuity, when rightfully speaking no one living or dead should ever have cared about anything other than the entertaining core mechanics which have always been the series’ hallmark? Why, indeed. Games have never been known primarily for the stories they tell – the best game narratives have been done in print or film dozens of times before, and for every Bioshock which depends on deeper storytelling to augment been-there gameplay, there are 100 Contras which barely mention the name of your character before the first wave of cat-eating aliens rushes you. Still, gamers attach a great deal of sentimentality to their faceless Master Chiefs and Mega Men, sometimes rivaling the fanaticism that has grown up around Tolkien or Star Wars. This is, of course, because gaming is capable of being far more immersive than film or printed word – in a sense, you become those nameless muscle-men, blasting your way through a jungle full of ninjas. Because a talented developer can count on the attachment that develops between you and these clumps of pixels and polygons, they don’t need an award-winning script to endear to you their game or its inhabitants. I can think of few other reasons why a mascot such as Mario should be so well-loved by so many people, despite never having uttered more than a sentence and a half of broken English in twenty-five years. We’ve spent so much time with him that we truly do care about him, even though he’ll never be able to return the favor because his copy of English for Plumbers-Turned-Vigilantes doesn’t include that phrase. Ecclesia is not going to wow you with its deep characters or a fully realized fantasy world. It doesn’t have to. You’ll have enough fun playing it that by the end of its twelve-or-so hours, even though the narrative is bested by Hop on Pop, you’ll still be a little sad to see it end.